The Ferrite magnet 10 Inch BL10 70 bass speaker gives 70 watts power handling into a 16 ohm load. The speaker has the same classic rounded rock sound with the tight low end definition that is associated with Celestion drivers. 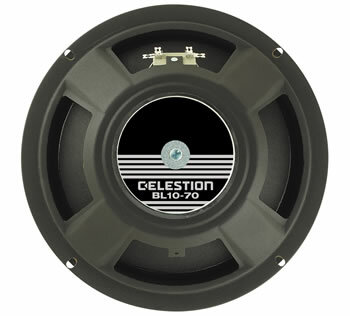 Celestion BL speakers provide the punchy bottom end with a traditional warm and mellow sound that has powered all the great bass cabinets. These tend to be used in old Trace Elliot 2 x 10 bass cabinets in place of the C10H as they have the same sound characteristics. This speaker is ideal for those bass players who want a traditional warm rock sound with a punchy smooth tone.